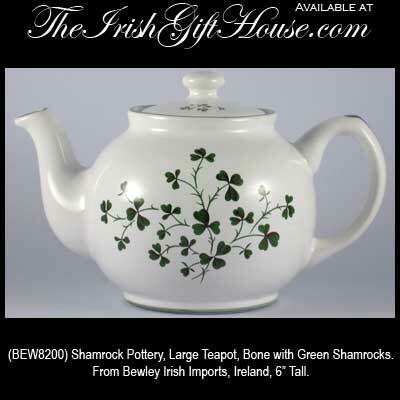 This large Irish teapot features green shamrocks on white pottery. Sorry, this shamrock teapot is temporarily out of stock. This Irish teapot features a green shamrock motif on both sides. The shamrock teapot measures 6" tall and it is made of earthenware. The teapot is both microwave oven and dishwasher safe. This Irish teapot is made in Ireland by Bewley's and is gift boxed with a shamrock history card that is complements of The Irish Gift House.